Like most households with small children, mine is drowning in paper. Drawings, writing, notes, handmade comics and all the other bits of scrawl that the kids create overflows from the baskets where we save them. And more arrives home in their backpacks every day. We periodically weed through these piles, saving some for posterity and tossing the rest, but the stacks keep growing.This is where a scanner like the Doxie Go can be mighty useful. The Doxie Go, the rechargeable battery model from a company that makes several versions, is small, light—at 14 oz—and portable. There's no power cord and you don't have to have it connected at all to a computer in order to scan and save. The internal memory is big enough to store 600 scanned pages, and there's an SD card slot for additional memory. Note, a single charge gave me under 100 scans, but that's still not bad. When connect via USB to my computer, recharging took several hours. 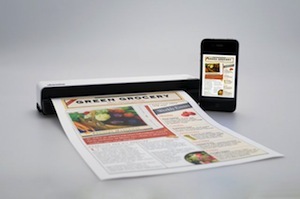 The device handles standard 8.5" x 15" paper and smaller, so don't expect to be scanning enormous artwork. You can scan at either 300dpi (fine for most black and white documents) or 600dpi. It's fast, too. Photos take about ten seconds, depending on size and resolution. Once you've scanned, you connect to the PC or Mac and import all your precious pages into files. You can then easily send files to Dropbox, Evernote, Google docs, Flicker and Twitter for sharing with others. The software also has some basic editing features that allow for crops, rotation and color fiddling. Files can be saved as PDFs, PNG or JPG. Lastly, Doxie features optical character recognition (OCR), so the content of your PDFs will be searchable later. And though this little device does plenty, it won't decipher your six-year-old's spelling. That you'll have to do on your own. Available from getdoxie.com for $199.00 or on amazon.com for $196.27.